The Dark Knight Rises movie ended the successful trilogy of Batman movies directed by Christopher Nolan. 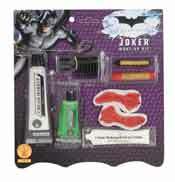 The spectacular worldwide success of the blockbuster movie sequel to Batman Begins and The Dark Knight has inspired a wide variety of bat related merchandises including toys, t-shirts, costumes, video games, decor, and Halloween costumes for fans to buy. Fans eagerly lined up to see Christopher Nolan's final Batman movie sequel The Dark Knight Rises in 2012. In this action packed film, the audience got to see the latest Batman villains Catwoman and Bane come to life on screen. 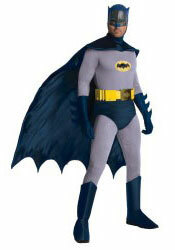 The good news for fans is the Justice League movies has brought back the popular of these Batman character costumes. 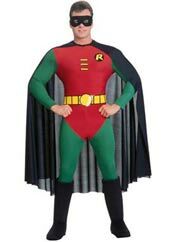 If you want to join the Batman phenomenon this Halloween season, take a look at our website and see which costume catches your attention. 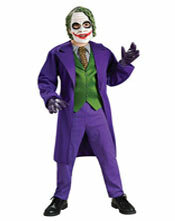 Now is your chance to suit up or dress up like your favorite DC comic book character for Halloween! 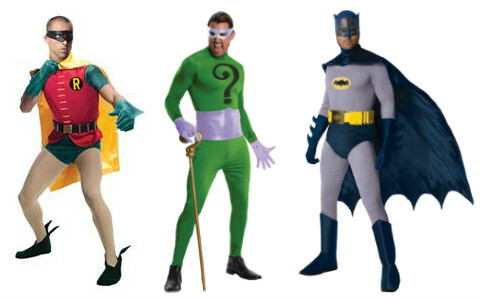 New Classic Batman TV Character Costumes! 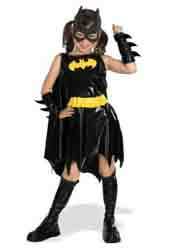 Inspired by Anne Hathaway's Catwoman character in the movie, this new Batman's Catwoman Halloween costume features a deluxe long sleeved black jumpsuit, headpiece, eye mask. belt, and gloves. Women dress sizes extra-small, small, medium, or large. Made by Rubie's Secret Wishes. 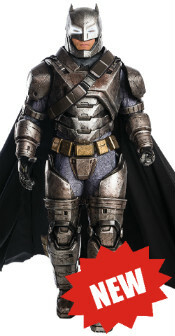 This is the newest version of the super deluxe Dark Knight Rises costume from Rubie's Grand Heritage costumes collection. 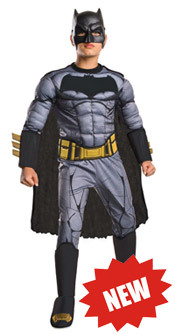 This officially licensed Batman costume is now lower in price than its predecessor. 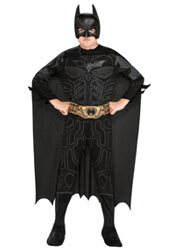 Impress your fellow Bat fans with this movie costume. Special Low Price Today! 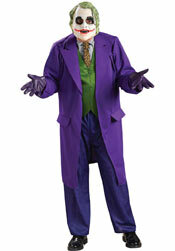 From Rubie's famous Grand Heritage Collection line of high quality costumes, this is the officially licensed The Joker costume set from the movie The Dark Knight. 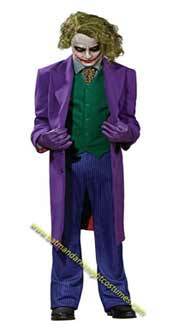 Dress up as Heath Ledger's infamous villain with outfit set consisting of Joker's coat, shirt, vest, pants, tie, gloves, wig and makeup. Available men sizes Medium (38-40), Large (42-44) and X-Large (44-46). 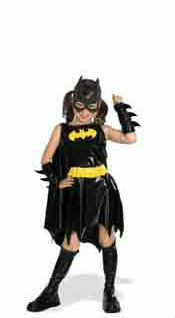 2 Day, Next Day or Express Overnight shipping are optional for Halloween delivery. Very LIMITED QUANTITIES in stock. 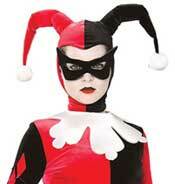 Harley Quinn is Joker's female counterparts in the Batman comic books and animated television series. 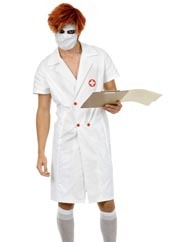 This women's Halloween costume includes a red and black jumpsuit with boot tops, gloves white collar, black eye mask, and matching headpiece. 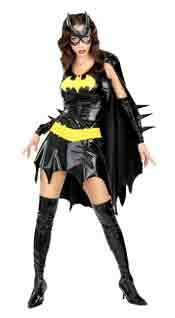 Part of DC Comic's Gotham Girls costume line. 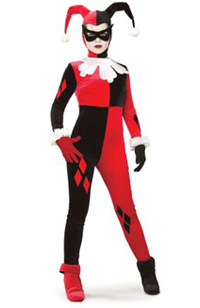 Also, new this year are the Arkham Asylum Nurse Harley Quinn costumes and the Arkham City Harley Quinn tanktop and pants costume. The film The Dark Knight is a sequel to Christopher Nolan's 2005 movie based on the caped crusader, Batman Begins, which was a reboot of the late 80s and 90s version of Warner Brothers' original successful Batman movie franchise, starting with Tim Burton's original Batman in 1989 starting Michael Keaton and Jack Nicholson who played the previous Joker. Tim Burton did the first two Batman movies from that period then Joel Schumacher took over as director and made Batman Forever with Val Kilmer in 1995 and then Batman & Robin in 1997 with George Clooney as Batman, Alicia Silverstone, and Arnold Schwarzenegger. Bad reviews and poor fan reception made it appear as though the franchise has been played out. After 7 years, Warner Brothers decided to resurrect the movie franchise, hiring Christopher Nolan to remake the movie series. 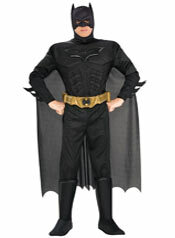 As a result, Nolan rebooted the movie, focusing on Batman's early days with a new younger Batman, played by Christian Bale. 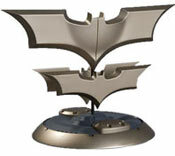 Critics and fans gave the new Batman movie positive reviews and the movie enjoyed a box office success, grossing more than $200 million dollars in the US market. 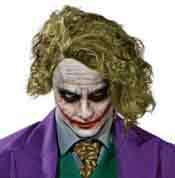 This success lead to Nolan creating another successful movie sequel, The Dark Knight, which won over fans once again. 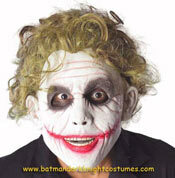 The success of the Dark Knight can be seen in its popularity of merchandise and costumes. On October 27, 2010, Warner Brothers confirmed rumors about the next Batman movie sequel which will be titled The Dark Knight Rises and will be directed again by Christopher Nolan. This will be his third Batman feature. Even though 3-D movies are now popular with Hollywood, Nolan does not have any plans on making the sequel in 3-D. The film, which will be shot mostly in Imax , will be starring Christian Bale once again as Batman, started shooting in May 2011. Joining the cast are Anne Hathaway as Selina Kyle, The Catwoman, and Tom Hardy as Bane. Liam Neeson and Cillian Murphy will return as Ra's Al Ghul and The Scarecrow. The story and plot are closely guarded to avoid major spoiling before the movie is released so details are still not clear regarding the storyline. The movie will be the final chapter in Nolan's trilogy for Batman. The film was released in movie theaters on July 20, 2012 in The United States, breaking record numbers around the world. The Dark Knight Rises Blu-Ray and DVD are scheduled to be in stores on December 4th just in time for Christmas! 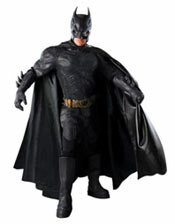 Due to the success of the latest sequel, there are many new Dark Knight Rises toys and collectibles available for sale for this Christmas holiday season. 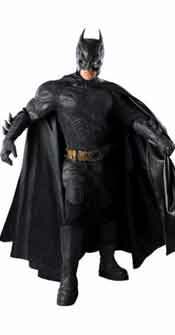 Check out the numerous models and action figures inspired by the movie!